I’ve downloaded my pictures from the last month or so tonight. So as not to overload anyone, I’m going to put them in a couple of posts, starting with our trip to Cap Haitian in early December. If you want the full details, check out my post on Dec 4th. This is Fedna, taken Nov. 30th in PAP. She is the girl I ask prayer for earlier when she was having seizures and had to be taken to a hospital in PAP. She responded well to the medication the doctors prescribed and the day of this photo was getting ready to return to FDN with the officers in charge of the children’s home there. Thanks for your prayers! Our trip to the north took us 13 hours, including the last stretch of about 2 hours through some fairly steep and winding mountain roads after dark. We arrived at the OMS compound and the home of our friends Doreen and Gordan at 8 pm. A couple of days later, when we were heading out to the beach, we discovered that the truck had picked up a nail somewhere along the way and had a flat tire. We were so grateful to God that this didn’t happen while on the road at night. 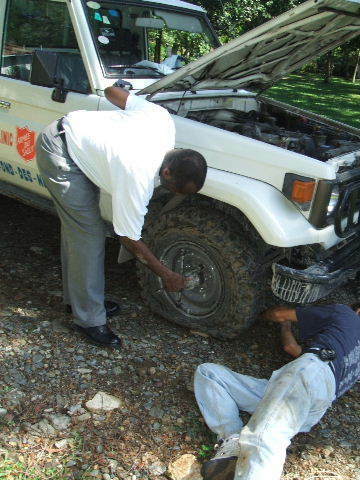 One of the missionaries in the compound helped Felix remove the tire and take it to the shop right there to get it repaired! God is good….all the time! And we were able to go to the beach and have a great time. Note the cruise ship in the background. 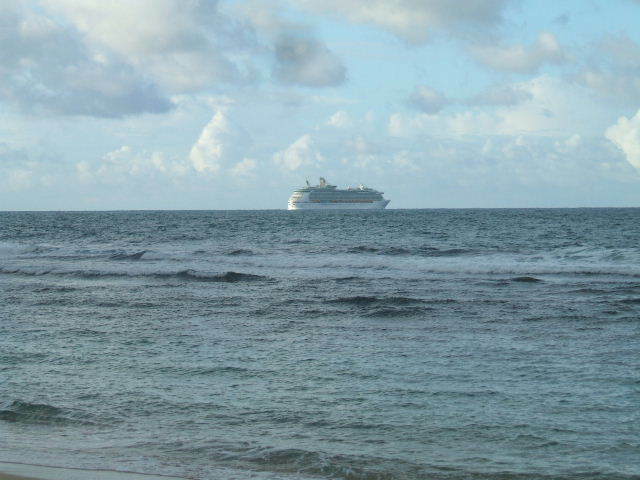 This is one of the few places in Haiti where the cruise ships come. I have heard it said that they tell them they are landing in “Hispanola” (the name of the island that Haiti shares with the country of the Domincan Republic) in order not to scare the tourists. The neat thing about this trip is that Matthew had his own fun playing with the children in the compound. Here he is doing “construction work” with Jake on the left and Junior in the middle. 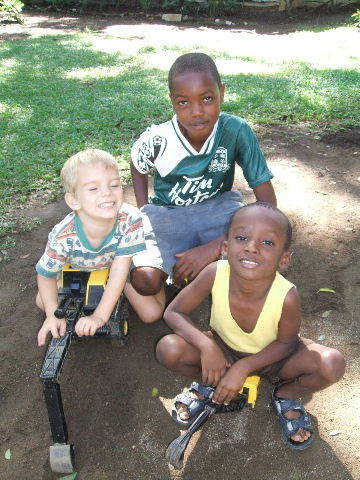 Since he is fluent in English and Creole he could easily go back and forth between the children. Our friends, Doreen and Gordon have recently come to the north of Haiti after managing the OMS guest house, ORMISO, in PAP for quite a few years. 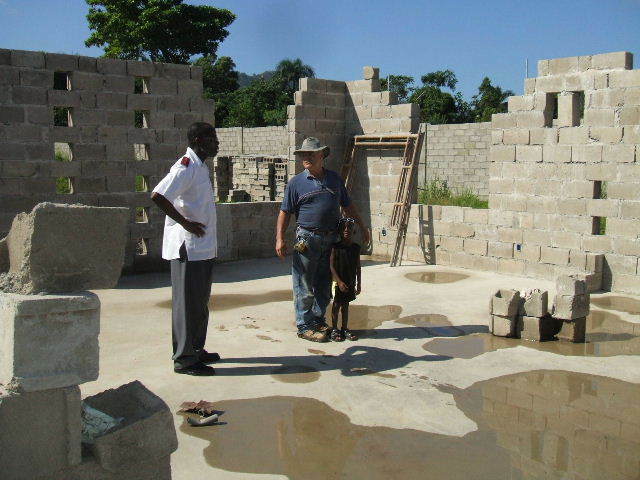 Doreen is teaching “English as a Second Language” at the seminary while Gordon directs the work teams that are coming in to build the new facilities for the seminary. Here Gordon is showing us some of the construction going on at the work site. 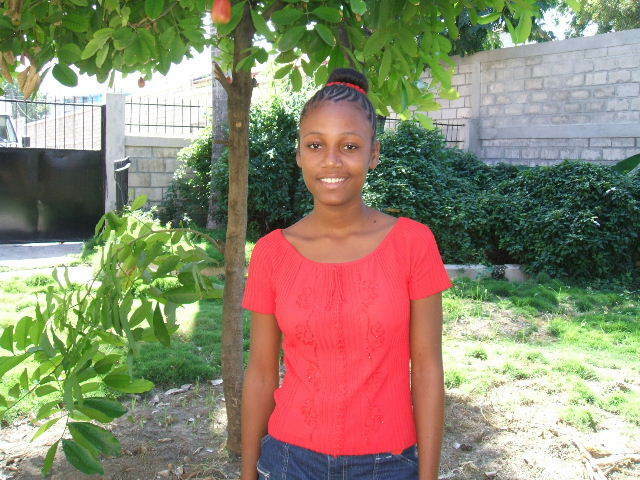 Fedna is a very beautiful young lady! I’m glad she is doing well and I continue to pray for her! The beach looks wonderful – especially since temps were only in the teens here last night! Take care! I enjoy your posts and pics! Blessings! Neat! Thanks for sharing the ministry that is going on there . Have a blessed week. I actually posted some pictures of me and Joe about a week ago. His mom is a photographer so she took some photos of us. I’ll post more though! Glad to hear that you were able to get away for a vacation. It looks like a wonderful location. ( I would have liked to be on that cruise ship. We are praying for you, your family and ministry.